Om is the sound of the Universe, of the Energy of Creation, it vibrates all around you, through you and within you. Connecting with the vibration of OM is a deeply spiritual and centering experience. Dr. Jane Ma’ati Smith C.Hyp. 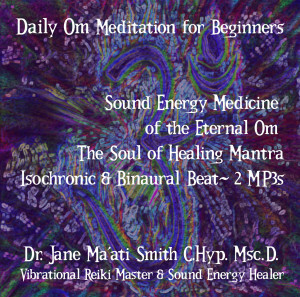 Msc.D., Vibrational Reiki Master and Sound Energy Healer, uses sound therapy techniques embedded within the Eternal Sound of Om, to bring the listener to a deep, level of Alpha/Theta meditation. Simply sit quietly, and listen, no meditation experience required. Just let the sound of OM wash over you.